Image © [caption id="" align="alignleft" width="240" caption="The flag of hacker collective Anonymous, at the Occupy London camp outside St Paul's Cathedral. 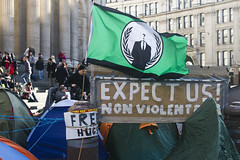 Image from Tamara Craiu's photostream"] [/caption] The Occupy London protesters camped outside St Paul’s Cathedral are often described by the media as ‘anti-capitalist’. But is this description correct? The first reason why it is not entirely correct is that many of the Occupy protesters aim to reform the capitalist system, not to overthrow it. While there are some groups involved in the movement who do have a revolutionary anti-capitalist ideology (such as the Trotskyist Socialist Workers Party), this is not true of everyone involved in it. UK Uncut, for example, have acquired a certain amount of radical chic since their formation last year, but there is nothing in their demands which amounts to calling for the overthrow of capitalism. In protesting against public sector cuts and demanding that the rich pay their fair share of tax, they are simply asking that the capitalist system be run in a way which narrows the gap between rich and poor, and which makes the poor better off. A second reason why the movement is not completely anti-capitalist is more intriguing: it is that right-wing libertarians have expressed interest in it. The fact that the libertarian left (i.e. anarchists and libertarian socialists) are involved in the movement is of course no surprise, but declarations of support from right-wing libertarians are rather puzzling, at first glance. This is because the libertarian right are staunch defenders of free market capitalism, and oppose any efforts to redistribute wealth. This makes them rather unlikely allies of a left-wing movement which protests against global inequality. However, there is one aspect of modern capitalism which is opposed by both the global Occupy movement and the libertarian right: corporatism. This is a system in which big corporations pressurize politicians to serve their interests, and politicians then manipulate the market in favour of those corporations, as well as giving them state hand-outs when they get into trouble (the banking bail-outs are a perfect example of this). The Occupy movement doesn’t like this system because they believe that it helps the rich to the detriment of the poor; the libertarian right doesn’t like it either, because they oppose state intervention in the market, and argue that it is wrong for the government to prop up failing businesses. Interestingly, there are other possible areas of common ground between the two groups: as internationalists, both oppose immigration controls; as secularists, both are opposed to the religious right; both have similar views on civil liberties issues, on the legalisation of drugs, and both are anti-war. If the Occupy movement does come to represent a bizarre alliance of the left and the libertarian right, could we see a new ideology emerge which contains elements of both? Such an ideology may have already come into existence, in the form of the ideas expressed by the Pirate Party and the hacking collective Anonymous. This philosophy could perhaps be described as digital libertarianism: a belief in the freedom of individuals to use and distribute digital information without hindrance from governments or corporations. Anonymous are involved in the Occupy movement, and their thinking seems to incorporate libertarian elements from both sides of the political spectrum: like the libertarian right, they have a strong belief in individual freedom and personal choice, but like the libertarian left, they are just as enthusiastic about confronting corporate power as confronting state power. However, the big challenge for an alliance of the left and right-wing libertarians (or ‘liberaltarians’, as such an alliance has been dubbed in the US), is to come up with an economic programme that will satisfy both groups. Both oppose bank bail-outs and the cosy relationship between big corporations and government, but beyond these two themes, there is very little for them to agree on in the field of economic policy. Therefore it could be some time before the Occupy movement and its potential allies are able to reach a consensus on what to do about the economic situation. However, world leaders have fared no better, having also failed to reach a consensus. We are at a rare juncture in history in which the world stands on the edge of a precipice: the global economic system is grinding to a halt, and no-one knows what to do about it. Is Occupy London really an anti-capitalist movement? The Occupy London protesters camped outside St Paul’s Cathedral are often described by the media as ‘anti-capitalist’. But is this description correct? The first reason why it is not entirely correct is that many of the Occupy protesters aim to reform the capitalist system, not to overthrow it. While there are some groups involved in the movement who do have a revolutionary anti-capitalist ideology (such as the Trotskyist Socialist Workers Party), this is not true of everyone involved in it. UK Uncut, for example, have acquired a certain amount of radical chic since their formation last year, but there is nothing in their demands which amounts to calling for the overthrow of capitalism. In protesting against public sector cuts and demanding that the rich pay their fair share of tax, they are simply asking that the capitalist system be run in a way which narrows the gap between rich and poor, and which makes the poor better off. A second reason why the movement is not completely anti-capitalist is more intriguing: it is that right-wing libertarians have expressed interest in it. The fact that the libertarian left (i.e. anarchists and libertarian socialists) are involved in the movement is of course no surprise, but declarations of support from right-wing libertarians are rather puzzling, at first glance. This is because the libertarian right are staunch defenders of free market capitalism, and oppose any efforts to redistribute wealth. This makes them rather unlikely allies of a left-wing movement which protests against global inequality. However, there is one aspect of modern capitalism which is opposed by both the global Occupy movement and the libertarian right: corporatism. This is a system in which big corporations pressurize politicians to serve their interests, and politicians then manipulate the market in favour of those corporations, as well as giving them state hand-outs when they get into trouble (the banking bail-outs are a perfect example of this). The Occupy movement doesn’t like this system because they believe that it helps the rich to the detriment of the poor; the libertarian right doesn’t like it either, because they oppose state intervention in the market, and argue that it is wrong for the government to prop up failing businesses. Interestingly, there are other possible areas of common ground between the two groups: as internationalists, both oppose immigration controls; as secularists, both are opposed to the religious right; both have similar views on civil liberties issues, on the legalisation of drugs, and both are anti-war. If the Occupy movement does come to represent a bizarre alliance of the left and the libertarian right, could we see a new ideology emerge which contains elements of both? Such an ideology may have already come into existence, in the form of the ideas expressed by the Pirate Party and the hacking collective Anonymous. This philosophy could perhaps be described as digital libertarianism: a belief in the freedom of individuals to use and distribute digital information without hindrance from governments or corporations. Anonymous are involved in the Occupy movement, and their thinking seems to incorporate libertarian elements from both sides of the political spectrum: like the libertarian right, they have a strong belief in individual freedom and personal choice, but like the libertarian left, they are just as enthusiastic about confronting corporate power as confronting state power. However, the big challenge for an alliance of the left and right-wing libertarians (or ‘liberaltarians’, as such an alliance has been dubbed in the US), is to come up with an economic programme that will satisfy both groups. Both oppose bank bail-outs and the cosy relationship between big corporations and government, but beyond these two themes, there is very little for them to agree on in the field of economic policy. Therefore it could be some time before the Occupy movement and its potential allies are able to reach a consensus on what to do about the economic situation. However, world leaders have fared no better, having also failed to reach a consensus. We are at a rare juncture in history in which the world stands on the edge of a precipice: the global economic system is grinding to a halt, and no-one knows what to do about it.